Maintaining that there is nothing more important than one’s health, Vital Proteins® manufactures a line of sustainably-sourced nourishing products designed to promote wellness and natural beauty. The products provide naturally derived bovine or marine collagen peptides, providing a full array of amino acids. Bovine collagen is sourced from grass-fed Brazilian cattle raised in alignment with Global Animal Partnership 5-step animal welfare standards. Marine collagen is derived from sustainably sourced wild-caught non-GMO Hawaiian fish in accordance with the Monterey Bay Aquarium Seafood Watch Program. Collagen peptides help support connective tissues, as well as promote joint, skin, hair and nail health. Odorless and tasteless, collagen peptide powdered formulas quickly dissolve in hot or cold liquids, making them very easy to incorporate into the daily diet. Products are manufactured in an NSF certified cGMP facility. Additional certifications include USDA Certified Organic, Kosher Certified and Non-GMO Project Verified. Products are tested by third party independent laboratories to ensure the absence of heavy metals and microbials. 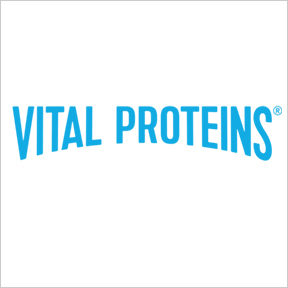 Vital Proteins’ clean, natural nutritive products contain no fillers, binders or artificial sweeteners. Vital Proteins® supports the Primo Center for Women and Children, a non-profit 501(c) organization committed to providing essential resources to empower individuals and families facing homelessness in and around the Chicago area. Collagen Peptides: This single ingredient top selling product provides highly digestible, quickly absorbed bioavailable collagen peptides in support of healthy joints, ligaments and tendons, as well as skin, hair and nail health. For maximum benefit, each serving provides 20 g of collagen peptides containing 18 essential and non-essential amino acids. Collagen peptides are sourced from pasture-raised, grass-fed bovine hides. Gluten, dairy and sugar free, paleo friendly. Marine Collagen: This Non-GMO highly bioavailable marine collagen is sourced from the scales of fresh wild-caught snapper. Each serving provides 10 g of marine collagen in support of bone, joint and digestive health, as well as youthful skin, stronger nails and healthier hair. Marine Collagen has no taste and quickly dissolves in hot or cold liquids. Gluten, dairy and sugar free, paleo friendly, single ingredient formula. Collagen Beauty Greens: This nourishing anti-aging blend combines Non-GMO marine collagen peptides with healthy organic greens such as wheat grass, alfalfa leaf, kale, spinach and barley grass. The formula provides 12 g of protein per serving along with vitamins, minerals, hyaluronic acid and probiotics in support of digestive and overall health, as well as glowing skin, strengthened hair and strong nails. Flavored with coconut water and Madagascar vanilla beans. Gluten and dairy free. Organic Free Range Chicken Bone Broth Collagen: Low sodium, MSG free and rich in vitamins and minerals, this beneficial one ingredient bone broth formula provides 9 g of collagen per serving along with chondroitin sulfate and hyaluronic acid. USDA certified organic bone broth is slowly simmered to extract the maximum benefits in support of joint, ligament, digestive, immune and overall health. The powdered, tasteless formula quickly dissolves in food or beverage of choice. Gluten and dairy free, kosher formulation. Collagen is the body’s most abundant protein, comprising approximately 30% of overall protein content, and 70% of the protein found in the skin. 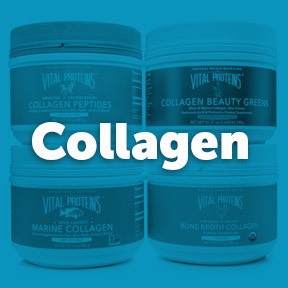 As the major fibrous protein of connective tissues, collagen is found in bones, muscles, skin, ligaments, tendons, blood vessels and the digestive system, as well as the extracellular matrix, an intricate network of macromolecules that determines the physical properties of body tissues. Without its strength and elasticity our bodies might literally fall apart, as collagen proteins form long chains that provide the structure that holds the body together. Although 16 types of collagen have been identified, the majority of collagen in the body consists of types I, II, and III, all of which support the health and function of tendons, ligaments, muscles, and cartilage and help the tissues to stretch and absorb shock. Largely composed of the amino acids glycine, proline, and hydroxyproline, collagen allows our tendons and ligaments to move with ease. It works synergistically with keratin to provide the skin with strength, smoothness, elasticity, and resilience. While some of us may think of collagen in terms of its effects on skin health, type I collagen fibrils have enormous tensile strength, such that it can be stretched without breaking. Collagen fibers found in tendons, where they connect muscles with bone, must be able to withstand immense forces. Per the National Institutes of health (NIH), gram for gram, type I collagen is stronger than steel. Type II, the major collagen of cartilage, allows joints to absorb shocks. Collagen is manufactured by specialized cells known as fibroblasts. Once secreted, collagen strands undergo binding, twisting, cross-linking, folding, and layering to produce the final product. As the enzymes that aid these conversions require vitamin C as a cofactor, a deficiency in vitamin C will inhibit collagen synthesis. As well, genetic defects, nutritional deficiencies and digestive issues can also affect collagen production. Over time, the natural creation of collagen begins to wane, and collagen fibers break down or no longer regenerate. Signs of degeneration include facial lines and wrinkles, as well as joint pain and stiffness. Lifestyle factors, such as smoking, excess sugar consumption, and high amounts of sun exposure may also contribute to depleting collagen levels. Supplementation with high quality, bioavailable collagen peptides may support bone strength, joint flexibility, skin suppleness, and intestinal health. Skin, hair and nail health: Collagen aids skin cell renewal and repair. Controlled studies have shown that collagen hydrolysate (peptides) improved skin elasticity, dryness, roughness and texture. Healthy hair and nail growth require collagen as well as keratin and minerals. Dietary collagen works from within to naturally enhance the skin, hair and nails by promoting the collagen formation that supports the skin’s moisture, helps to strengthen nails and adds volume to hair. Joint health: Collagen loss can lead to joint pain, stiffness and swelling. Studies published in the International Journal of Medical Sciences found that daily supplementation with collagen decreased painful joint swelling and enhanced daily activities, generally improving quality of life for those suffering from joint issues. Gut health: Amino acids in collagen help to build the connective tissue that lines the colon and the gastrointestinal tract, helping to prevent intestinal permeability or leaky gut. Consuming more collagen may help to soothe and heal the lining of the intestinal tract. Blood vessel health: Collagen surrounds every blood vessel and protects the vessel from damage. Along with elastin, collagen helps keep the inside of arteries and veins smooth and elastic, allowing the transport of blood, nutrients and oxygen throughout the entire body. Muscle health: Collagen fibers make up skeletal muscles, as well as smooth muscles found in the bladder, heart, and reproductive system. Collagen fibers provide muscles with the strength and structure necessary for movement and function. Foods rich in amino acids, such as beans and soy. Anthocyanidins found red, blue, and purple fruits and vegetables. Fruits and veggies with high vitamin C content, such as oranges, peppers, and broccoli. Foods high in vitamin A, such as dark leafy greens, tropical fruits, oysters, and oily fish. Plant foods that provide beta-carotene, such as sweet potatoes and carrots. Resveratrol and flavonoids from fruits and vegetables provide antioxidants that protect collagen and elastin for skin elasticity. These compounds boost circulation to the tiny blood vessels near the skin’s surface, thereby enhancing the skin’s natural radiance. Hyaluronic acid (HA), found in bone broth, increases skin hydration, stimulates collagen production and improves skin elasticity. Foods that support the natural production of HA include root vegetables, tofu, and tempeh. Collagen Peptides: This very popular and easy to use supplement provides 18 g of protein and 20 g of 100% pure collagen peptides per serving in support of strong bones, youthful skin, reduced joint discomfort and restorative sleep. Sourced from bovine hide, this minimally processed, pasture-raised, grass-fed product is flavorless and odorless and mixes easily with cold or warm food or drink. Gluten and dairy free, paleo-friendly, kosher formulation. Marine Collagen: This product supplies Non-GMO collagen peptides from verified wild-caught snapper in support of joint and digestive health, as well as youthful skin, healthier hair and stronger nails. Gluten free, Non-GMO, kosher formulation. Organic Free-Range Chicken Bone Broth Collagen: USDA organic chicken bone broth is crafted with bones from free-range chicken that is slowly simmered to extract maximum nutrients. Low sodium, MSG free, and rich in vitamins and minerals, this clean, tasteless, quickly absorbed powder supports digestion, aids immune function and promotes overall wellness. Gluten free. Collagen Beauty Greens: This nourishing elixir provides Non-GMO Marine Collagen Peptides blended with healthy organic greens, hyaluronic acid, and probiotics in support of collagen formation, increased skin hydration, strengthened hair and nails, and overall wellness. Flavored with organic coconut water and Madagascar vanilla bean, this product provides a full array of amino acids, as well as vitamins, minerals and nutrients. Gluten free, Non-GMO, kosher formulation.